A pediatric dentist is a doctor of dentistry who has additional specialized training following dental school, and limits his or her practice exclusively to the treatment of children and teens, including those with special needs. Pediatric dentists attend a two year pediatric dental residency program in addition to their four year doctoral and undergraduate degrees. A visit to the dentist can be intimidating for little ones. The pediatric dental experience is designed to alleviate their fears – from the office design and amenities to the dentist’s specialized training. A child’s oral health is an important part of their overall health. Dr. Sara has been specially trained over several years to work specifically with children. She and her team only work with kids – each and every day. As a children and teens only dental office, Smyrna Pediatric Dentistry is current on the latest advances in dentistry for children. Just as a pediatrician develops his or her special talents, skills and knowledge for working with children’s overall health, a pediatric dentist does the same to more effectively manage a child’s dental health. To learn more about Pediatric Dentistry, please visit HealthyChildren.org. Begin daily brushing as soon as the child’s first tooth appears. Before age 2 years, only use a smear or “rice grain” amount of fluoride toothpaste. Between ages 2 and 6 years, use a “pea-sized” amount of fluoride toothpaste. By age six, children should be able to brush their own teeth twice a day with supervision to make sure they are doing a thorough job. Each child is different, and your dentist can help you determine whether the child has the skill level to brush properly. Proper brushing removes plaque from the inner, outer and chewing surfaces. When teaching children to brush, place toothbrush at a 45 degree angle; start along gum line with a soft bristle brush in a gentle circular motion. Brush the outer surfaces of each tooth, upper and lower. Repeat the same method on the inside surfaces and chewing surfaces of all the teeth. Finish by brushing the tongue to help freshen breath and remove bacteria. Flossing removes plaque between the teeth where a toothbrush can’t reach. Flossing should begin when any two teeth touch each other. You should floss the child’s teeth until he or she can do it alone. Use about 18 inches of floss, winding most of it around the middle fingers of both hands. Hold the floss lightly between the thumbs and forefingers. Use a gentle, back-and-forth motion to guide the floss between the teeth. Curve the floss into a C-shape and slide it into the space between the gum and tooth until you feel resistance. Gently scrape the floss against the side of the tooth. Repeat this procedure on each tooth. Don’t forget the backs of the last four teeth. Dental sealants protect the surfaces of back teeth where most cavities in children are found (and most chewing occurs). Made of clear or shaded composite resin, sealants are painted onto the tiny grooves and depressions in the molars. They seal these cracks and opening, and prevent food from becoming lodged and plaque from forming. The application of sealants is quick and painless for kids. Your dentist can determine which of your child’s teeth can most benefit from sealants. How can I make my child more comfortable about visiting the dentist? You can help make your child’s first visit to the dentist enjoyable and positive. Your child should be informed of the visit and told that the dentist and staff will explain all procedures and answer any questions. It is best if you refrain from using words around your child that might cause unnecessary fear, such as needle, pull, drill or hurt. Pediatric dental offices make a practice of using words that convey the same message, but are pleasant and non-frightening to the child. Why are X-Rays important for kids? X-rays are a vital and necessary part of your child’s dental treatment. Without them, certain dental conditions can and will be missed. X-rays detect much more than cavities. For example, radiographs may be needed to survey erupting teeth, diagnose bone diseases, evaluate the results of an injury, or plan orthodontic treatment. Radiographs allow dentists to diagnose and treat health conditions that cannot be detected during a clinical examination. 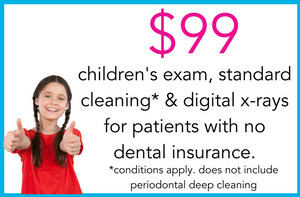 If dental problems are found and treated early, dental care is more comfortable for your child and more affordable for you. It is recommended that your child get X-rays and examinations at least once a year, but you should consult your child’s dentist for frequency. What is considered a dental emergency for your child? Toothaches: Clean the area of the affected tooth thoroughly. Rinse the mouth vigorously with warm water or use dental floss to dislodge impacted food or debris. If the pain still exists, contact your child’s dentist. Bitten Tongue, Lip or Cheek: Apply ice to bruised areas. If there is bleeding apply firm but gentle pressure with a gauze or cloth. If bleeding does not stop after 15 minutes or it cannot be controlled by simple pressure, take the child to a hospital emergency room. Knocked Out Permanent Tooth: Find the tooth. Handle the tooth by the top, not the root portion. You may rinse the tooth but DO NOT clean or handle the tooth unnecessarily. You can transport the tooth in a cup of milk or in saliva. The patient must see a dentist IMMEDIATELY! Time is a critical factor in saving the tooth. Is it important to take care of baby teeth? It is very important to maintain the health of baby teeth, even though they will ultimately come out. Not taking care of the baby teeth can negatively affect the development of permanent teeth. Baby teeth are important for (1) proper chewing and eating, (2) providing space for the permanent teeth and guiding them into the correct position, and (3) permitting normal development of the jaw bones and muscles. Baby teeth also affect the development of speech and add to an attractive appearance. While the front 4 teeth last until 6-7 years of age, the back teeth aren’t replaced until age 10-13. How can I take care of my child’s teeth at home to prevent dental problems? Begin daily brushing as soon as the child’s first tooth appears. A small amount of fluoride toothpaste can be used after the child is old enough not to swallow it. By age six, children should be able to brush their own teeth twice a day with supervision until about age seven to make sure they are doing a thorough job. However, each child is different. Your dentist can help you determine whether the child has the skill level to brush properly. Proper brushing removes plaque from the inner, outer and chewing surfaces. When teaching children to brush, place toothbrush at a 45 degree angle; start along gum line with a soft bristle brush in a gentle circular motion. Brush the outer surfaces of each tooth, upper and lower. Repeat the same method on the inside surfaces and chewing surfaces of all the teeth. Finish by brushing the tongue to help freshen breath and remove bacteria. Flossing removes plaque between the teeth where a toothbrush can’t reach. Flossing should begin when any two teeth touch each other. You should floss the child’s teeth until he or she can do it alone. Use about 18 inches of floss, winding most of it around the middle fingers of both hands. Hold the floss lightly between the thumbs and forefingers. Use a gentle, back-and-forth motion to guide the floss between the teeth. Curve the floss into a C-shape and slide it into the space between the gum and tooth until you feel resistance. Gently scrape the floss against the side of the tooth. Repeat this procedure on each tooth. Don’t forget the backs of the last four teeth.